Automatic Greasing Systems for Chain Lubrication: FLO Components – automatic greasing systems specialist and leading supplier of lubrication equipment and supplies: automatic conveyor lubrication systems, automatic roller chain grease system, central lubrication – FLO Components – Automatic Lubrication Systems Specialist in Ontario and Manitoba. Friction creates heat, causing parts to expand. This leads to wear and the production of “wear particles” which turn into tiny cutting tools that cause chatter and vibration and generates heat. The result – mechanical failure, expensive equipment replacement, unscheduled downtime, lost production, safety hazards, environmental and cleanup problems and more. An Automatic Chain Lubrication System is a cost effective way to limit wear and the costly problems it causes. In fact, proper lubrication can double or even triple the life of your chains. FLO carries a full range of chain lubrication systems, in drip, brush, spray and roller configurations, to extend chain life, cut downtime, save electricity and increase profits. There are several types of automatic chain lubrication systems available: “Spray or Oil Mist” Systems, “Squirt” Systems, Automated Metering Valves & Pump Systems, and “Drip Feed, Oil Cup or Sight Feed” Lubricators. Each system will have advantages and disadvantages. It is up to the individual Plant and maintenance professionals to determine what works best for their specific application. Read the article below to learn about some of the key things to consider when choosing a lubrication system, then contact us to discuss your specific application with a lubrication expert. FLO provides Solutions for applications for all types of conveyors and chains. Ranging from basic to complex, our Solutions are widely used in such diverse production settings as: Paint Finishing Lines, Food Processing Plants, Mineral Processing Facilities, Automotive Assembly Lines, and more. A typical Solution consists of a lubricant reservoir, metering valve(s) and fluid regulator, and connecting fluid lines. 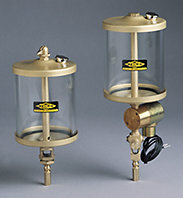 The Lubrication Systems dispense from a variety of custom sized reservoirs or original material supplier containers. All equipment is supplied with hard and soft parts compatible with the fluid being dispensed. The metering valves deliver pre-set measured shots to consistently meet the application’s requirement. One example is the ORSCO 170 series system. 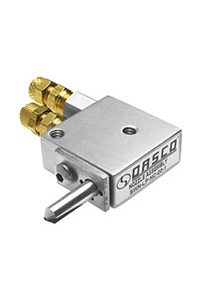 The ORSCO 170 series system is designed as a modular unit, for precision lubrication applications. 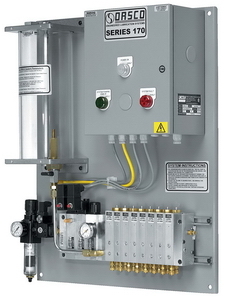 Its integrated electrical control box provides the right amount of lubricant at the right time. The innovative injector stack design delivers a small metered amount of lubricant on a continual and controlled basis, resulting in significant cost savings by decreasing lubricant consumption, reducing product contamination and eliminating under/over lubrication. It can handle applications requiring large amounts of lubrication. A high injector cycle rate delivers nominal flows of up to 4 drops per second (at 2 Hz). Precision is maintained by precise injector outputs of either a half drop (0.015cc) or two drops (0.060cc) per cycle. 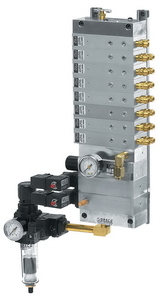 Consolidated manifold design minimizes external piping, allowing for maintenance without removing the complete unit. Single control network for stack of up to 8 injectors simplifies adjustments. System can be supplied without integrated control box to allow integration into machine PLC. Spray nozzle air-oil mixtures provides on-going cleaning action on your chain and conveyor moving parts. Wide range of nozzle styles means the nozzle is fitted to your application. Typical return on investment is less than 1 year. FLO combines the ORSCO system with Anderol Baking Chain Oil 150, a high performance ester based chain oil designed for use in high temperature applications. It prevents wear and minimizes deposits with a natural detergency to maintain cleaner chains with fewer operational problems. Contact us now with your application details. Based on your information, we will recommend the best Automated Lubrication System to meet your application’s specific requirements.